The Omni Plant is a wonderful little bush that grows copies of whatever you feed it. It is in the Special category of plants. Your sim needs to have Gardening Skill level 10 to plant the Omni Plant. 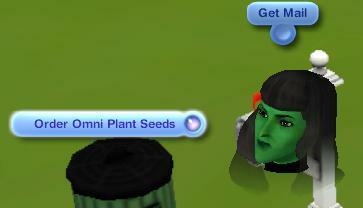 Unlike most plants, you cannot find Omni Plant seeds lying on the ground. 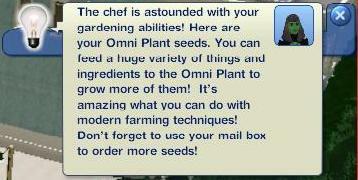 To get Omni seeds, you must complete certain opportunities related to the Gardening skill. 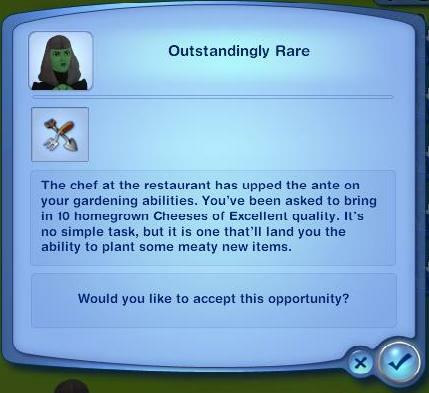 You will get these opportunities randomly once your sim has reached Gardening level 8. 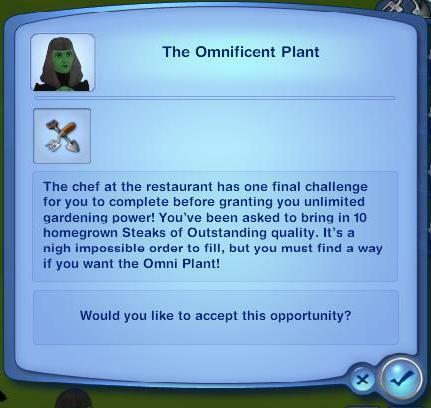 Once you have completed the final opportunity, you will receive some Omni Plant seeds as well as the ability to order more by clicking on the mailbox. Simply harvest 20 Excellent quality items. Completing this opportunity will open up the ability to plant what you need for the next opportunity, Cheese. Grow and harvest 10 Excellent Cheeses. Completing this opportunity will open up the ability to plant what you need for the next opportunity, Steak. Grow and harvest 10 Outstanding Steaks. Completing this opportunity will open up access to the Omni Plant seeds. Here are some of the items that can be fed to the Omni Plant. The following lists some of the items that cannot be fed the Omni Plant. Some are obvious (cars), some are not so obvious. 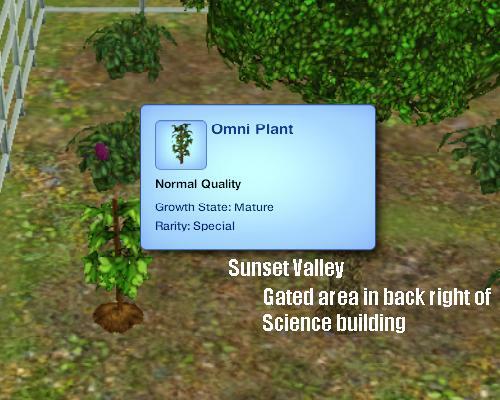 Like the Death Flower Bush, there is a mature Omni Plant in both Riverview and Sunset Valley. The plant is located at the science lab. When facing the front of the Soil and Water Research Facility, plant is at the back righthand corner. 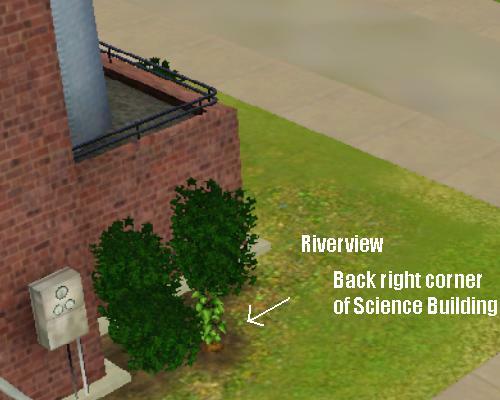 When facing the front of Landgraab Industries Science Facility, plant is on the back righthand side, in a gated-off garden area. Example of the Omni Plant after growing some Rubber Duckies. Example of the Omni Plant copying rare/hard to catch fish. This page has been accessed 147,620 times.